Developed in response to the need for effective hock treatment, the Ice Vibe Hock comfortable neoprene boots wrap around the hock and feature built in pockets to hold the massaging panel in place which can be used on the inside or the outside of the hock and cold packs can go either side of the hock. Cold packs can be heated in warm water to combine heat and massage before exercise to help reduce stiffness. Ice vibe Hock used with cold packs can minimise inflammation whilst maintaining bloodflow. Can help improve on ligament injuries, sprains, bruising and arthritis. 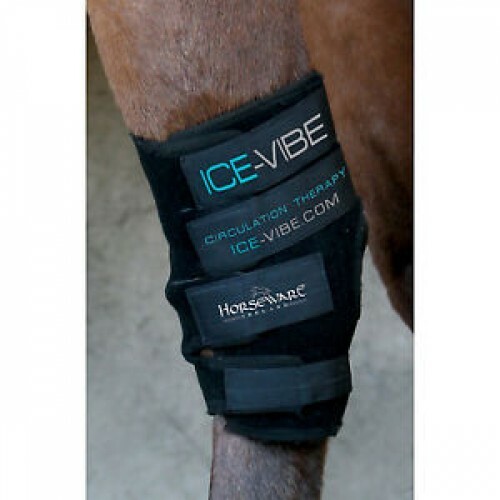 Ice Vibe Hock used without cold packs can help to boost blood supply to horses legs by creating movement through massage. This can be beneficial for: helping to remove toxins, bring oxygen to horses legs and stimulate repair.